I know where this picture was taken, but not when, or who it is. Monaco, Excelsior Art Gallery, 183 Main Street, Stockton, Cal. “The most artistic photographic work guaranteed, at moderate prices.” Ben Batchelder owned several photo galleries in Stockton from 1872 to 1891, but not necessarily the Excelsior at 183 Main…. So the picture is still undated. Once a year (usually in December) I try to remind readers to use family get-togethers as an opportunity to bring out that box or scrapbook full of old family photos and go through them with the eldest members of the family. Try to put names to the faces. Someday, someone might thank you. (And you might hear some surprising stories….) If you’re lucky, more than one person will be able to put a name to the faces in the photos. Great hat. Now, who and when was he? A member of my family? or a friend who gave his picture to a pretty girl or to a member of the same fraternal organization? There’s no name on the back. I’d also like to date his suit, hat, etc. If I knew his name, I could probably find out what he did for a living, and where he fit in the socio-economic scale. Did he live in Stockton, which was quite a large city by the 1880’s? Or was he a farmer who came into town so rarely that he had his picture taken to commemorate the event? These children were also photographed in Stockton. I used Pioneer Photographers of the Far West to date these photos. Two photographs taken at the Pioneer Gallery, 198 Main St., Stockton, CA. A photographer named Ben Batchelder was active in Stockton from 1872 to 1891, but he only had the Pioneer Gallery at this address for three years: 1884 to 1887. It’s a clue; it eliminates some possible relatives because they were too old or too young to be this age in those years. It’s nice to be able to date these photos — but it would be nicer to know more about them. The date is not enough to identify this boy and girl. Unknown boy in suit with short trousers, big bow. Photographed in Stockton, CA, between 1884 and 1887. Unknown girl in a wool dress that looks home-made. Photographed in Stockton, CA, between 1884 and 1887. By the 1980’s I had only one relative I could ask about family photos from the 1880’s and early 1900’s: my Aunt Dorothy, also known as Dot. (We can usually identify our close relatives, even if the picture was taken before we were born.) However, as I try to verify names and dates from public sources, I am discovering that — in the words of literary critics — she was an “unreliable narrator.” And, since I have been using photos she identified and dated to identify other photos, I made a serious error. I had already figured out that some of the photos I inherited from Dot were probably labeled years after they were taken. This photo — and many taken on the same weekend — says Monte Rio, July 4, 1921. Dot is 3rd from left, and my mother is on the far right. Dot (back to camera) and The Gang from the Office, Truckee, CA, 1921. Four women in Santa Cruz, CA, 1921. Dot is third from left. For more about their clothes, click here. Alice Barton: 1900’s, 1930s, 1950s. My very young Aunt Dot is sitting on the steps with her brother Mel (in sailor suit.) The woman in stripes, center, is her Aunt Alice (my great-aunt.) But — is the woman in white her Aunt Cora or her Aunt Laura? I’m no longer sure. I believed that my Aunt Dot could tell the difference between her Aunt Laura and her Aunt Cora — they were still alive when she was an adult. But… trusting her identification of photos, I think I wrote a post about the wrong one! I subscribed to Ancestry.com a few years ago only because I wanted to access its collection of Sears, Roebuck catalogs. (And I would recommend this to anyone who needs to research “everyday clothing” instead of couture. You’ll get more information for $20 a month than from a dozen books.) But, once I noticed that Dot’s spelling of names was quite variable, I began using Ancestry.com to try to find the correct spelling of names for the people in her photos. Azalia Dellamaggiore (as spelled on census records) on the courthouse lawn in Redwood City, CA, dated 1918. Dot’s shadow as she takes the picture is included. Dale Lucchesi [she wrote Lucassi here] sent this photo of himself to my aunt. Early 1920s. Studio portrait of Caston Popescul mailed from Columbus, Georgia, dated 1920. (He’s retained his WW I military haircut. For reasons I don’t understand, this haircut was back in fashion in 2017!) Caston was a soldier in the American Army when he applied for U.S. citizenship in 1918. Then there’s a military man sometimes identified as “Val:” Volowsky or Walasky or Walisky …. “Volouskey” (or “Valowskey”?) changes a tire while Jack and Dot look on. “Walasky” with a tank, on the Stanford University campus in Palo Alto, CA; dated 1920. There was a WW I military camp, Camp Fremont, in nearby Menlo Park. Nick and “Walisky” at Neptune Beach. Dated 1920. Dot and the soldier-with-the-hard-to-spell-name at Neptune Beach, Alameda, California. Dated 1920. I’m finding some wild spelling variations on census reports, too — possibly the fault of the census taker, or the person who happened to be at home to answer questions when the census taker knocked on the door — or a transcription error made when the hand-written census forms were typed into a database. You wouldn’t think a four-letter name like Lipp would be a problem — but I found some Lipps under the name Siff. And Sipp. And Gipp. Barton showed up as “Baldhoe” in 1940. So just imagine the variations I’ve found for the family of Augustus Feodorovich Moosbrugger, who emigrated from tzarist Russia at the age of 19 and married one of the Lipp girls; the name on her tombstone is “Alice Moosberger” — and my aunt Dot pronounced it “mooseburger.” Tasty! I’m so glad someone identified this couple; it’s my mother’s father with Emma Emerson, whom he did not marry. Signed on the back, “Geo E. Meekins, Menlo Park, California.” It also says, “Age 25.” I found him in the Register of Voters: he was 25 in 1890. How satisfying! The back of Meekins’ portrait is inscribed — in elaborate writing — “Geo. E. Meekins … Compliments to Miss Lillie M. Lipp,” Dorothy’s mother (my maternal grandmother.) Below, my Aunt Dot wrote, “Mama’s first fellow.” I think she got that one right. Unknown woman in the snow, white fur muff and stole, probably 1917 to 1922. I’m still looking for a photo that will identify her…. P.S. Thank you, Aunt Dorothy, for hundreds of photos! I found this souvenir group photo of a trip up the Mount Lowe electric railway, apparently taken in the late 1920s. A group photo of visitors to Echo Mountain, on the Mount Lowe scenic railroad. Late 1920s. “At the top of the incline was perched Charles Lawrence, the official photographer, on a special scaffold from which he would take pictures of the arriving visitors. For 25 cents, visitors could purchase a souvenir photo of their arrival on the incline car, with everyone else aboard, of course.” — From Wikipedia, which has a thorough history and some excellent images. Click here. Front cover of Mount Lowe souvenir photo from the late 1920’s. Inside cover of Mount Lowe photograph. Late 1920’s. Parts of the rail trip would definitely result in an adrenaline rush: click here. Of course, what fascinates me are the faces and clothes of this group of ordinary people on holiday — even if it’s just a day trip. Thanks to the magic of computer scanning and photo enlargement, (and the sharpness of Lawrence’s original photo) we can see them in some detail. I’ve cropped the picture to show just the people. Echo Mountain, Mount Lowe, 1920’s. I was about to mention that all the women are wearing hats — until I saw one who isn’t: my mother. Top row, from left, my mother’s mother, her aunt Alice, and, Marcelle-waved but hatless, my mother. Notice her “bee-stung” lips. The woman in the pale cloche wears a necktie, and so do other women, as you’ll see. A group from the top right side of the photo. We see several women wearing horn-rimmed glasses, which were replacing glasses with thin gold or silver rims — or no rims at all. The woman at center wears the older stye of glasses. It’s apparently summer, since many men wear light colored hats or boaters. Women are evenly divided between cloche hats and hats with brims. Love that striped sweater! The center of the photo. The boy in the front row also wears a lively, patterned sweater. 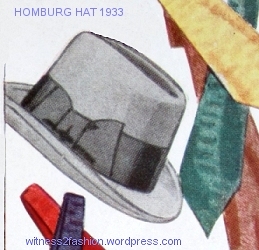 At the back, we see a boy in a cloth cap (a big one) next to a woman in a turban-like hat; 1920’s printed dress fabrics include the Art Deco one at right. The man’s tie is short, stopping inches above his waist. Another short necktie, and a pleasant-looking woman wearing horn rim glasses and a ribbon-trimmed dress. A good sample of hats — and a woman who clearly wore large sized dresses. The striped hat on the right is my favorite — and it’s worn by a mature lady in a print coat. The gray-haired woman in the light-colored cloche at lower right must have seen many changes in fashion during her lifetime — and she’s adapted well. In the front row we can see a variety of hem lengths, depending on age and taste. Late 1920s. The older woman at left has a long hemline (and I think her slip is showing,) while the mature but stylish woman on the right shows her legs up to the kneecap. In this group, the woman on the right wears a shorter skirt than the oldest woman pictured above, but not as short as the woman in the Art Deco print dress. The young girl has bare legs and exposed knees. The boy proves that not all great sweater and knicker combinations were reserved for the golf course. Hope you enjoyed the trip! Visitors to Mount Lowe in the late 1920’s. A similar crowd photo, found on Flicker, is dated 1922. It includes four young women woman (front row, far left) in hiking trousers and boots. The ruins of the Mount Lowe Railway are a hiking trail today. It is near the city of Altadena, California. The expression “Joe College” in Esquire, January 1934, caught my eye. I have a few other illustrations of “college life,” and will find more, no doubt. Perhaps it’s because the school year starts in September, but an autumnal color palette is common to them. 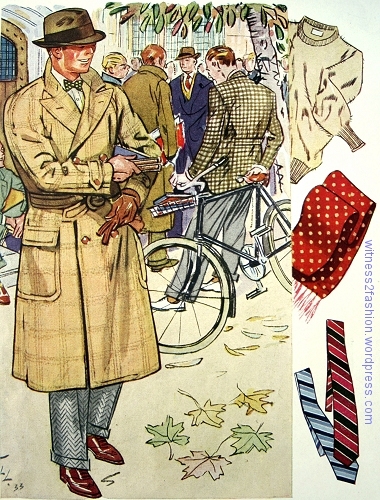 Also, clothes for college men were more casual than business dress, and clothes for male country wear and sports traditionally echoed the colors of the landscape, favoring tweeds in browns and loden green over navy blue and charcoal gray. 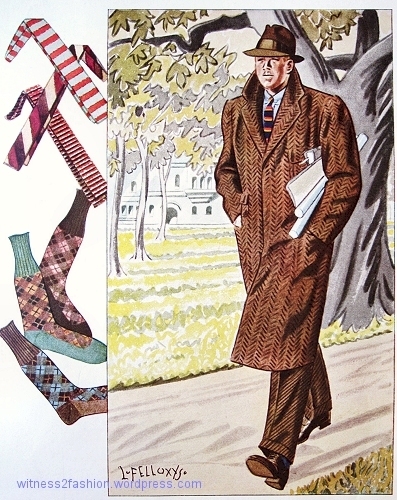 The clothes featured in Esquire had an upper middle class, East Coast bias. Yale’s bulldog mascot appears at top left. 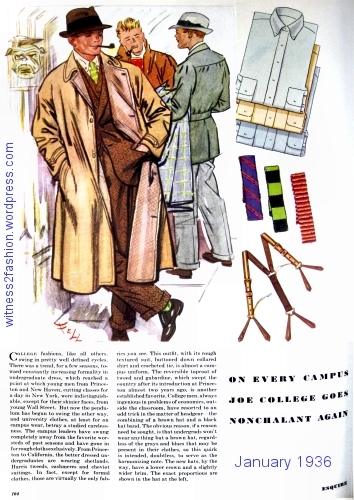 Joe College as drawn by L. Fellows for Esquire magazine, January 1934. Pg. 104. A Yale bulldog is on the pillar behind his shoulder. 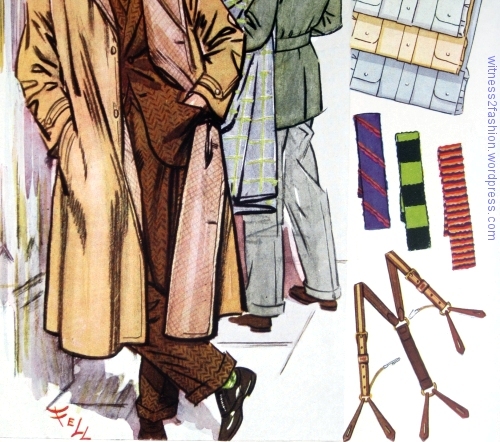 Belted jackets, like the greenish one in the background, evolved from country wear to urban sports jackets. The coat over that student’s is a large-scale plaid. 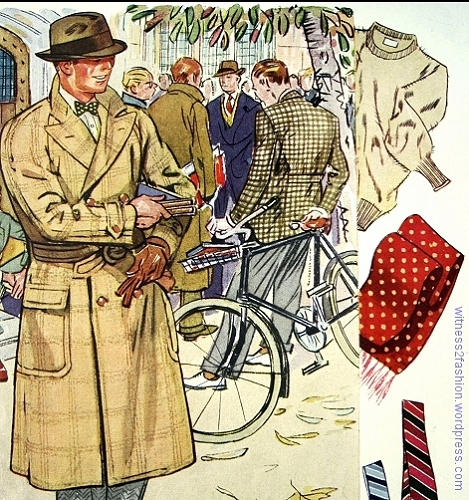 The student in front wears a three-piece brown suit, a shirt with a button-down collar, and a knit tie under his reversible tan overcoat with cuffs that can be made tighter at the wrist with a button tab. 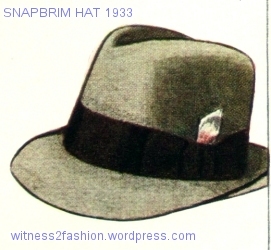 Two out of three wear snap-brim hats or smoke pipes. Detail of suit, coat, etc. Ivy League College students. 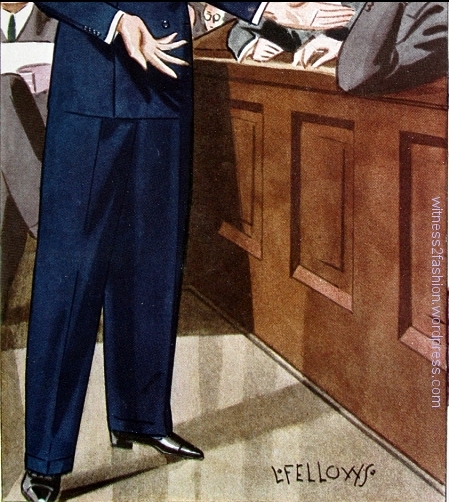 Esquire, Jan. 1934. 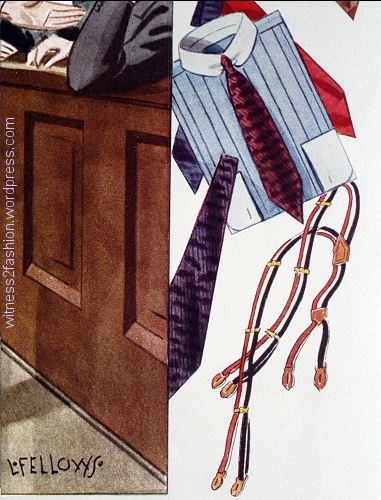 Solid-colored, button-down shirts with matching cuffs and collars, Esquire, Jan. 1934. Soft-collared shirts — button-down, in this case — were replacing shirts with detachable collars, in offices as well as on campus. 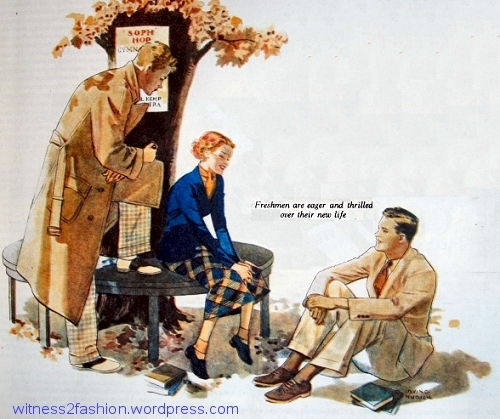 Other college trends were pictured in the Autumn, 1933 issue of the magazine. 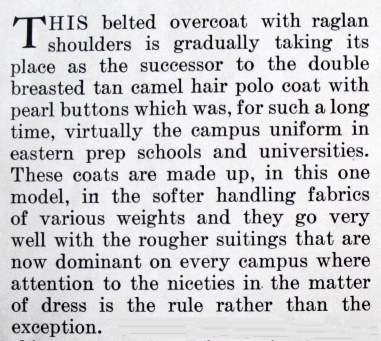 Correct clothing for underclassmen, Esquire, Autumn 1933, pg. 58. Illustration by L. Fellows. Description from Esquire, Autumn, 1933, p. 58. Clothes for Underclassmen. Esquire, Autumn 1933. Bow tie or rep or wool tie, button-down shirt, camel-hair pull-over sweater, belted coat with raglan sleeves, snap-brim semi-homburg hat. 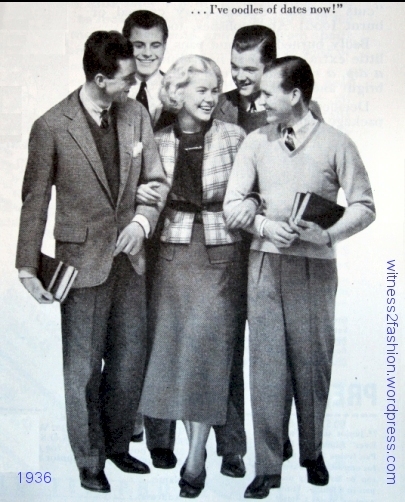 College students, from the April 1936 issue of Woman’s Home Companion. Three of these men wear sweaters. The man at left wears a shirt with a collar pin under the tie knot, a V-neck sweater, a tweed sports jacket, and cuffed trousers in a darker shade than his jacket. (A decade later, this was the “uniform” of a college professor.) All four male undergraduates wear neckties to class. In Esquire, on the page facing the clothes for underclassmen, this outfit was recommended for upperclassmen and young, recent graduates. 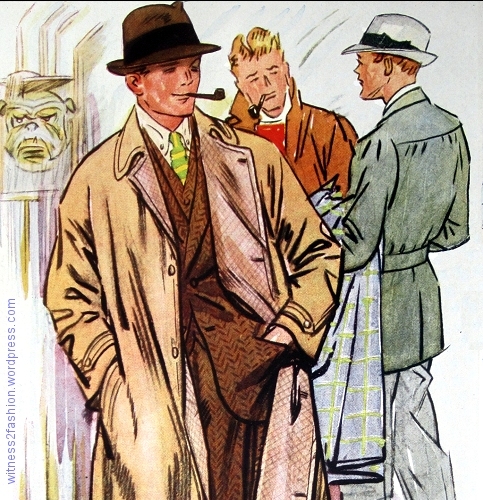 Clothes for upperclass college men or recent graduates according to Esquire, Autumn 1934, p. 59. I would have thought that a gray coat would be recommended for graduates looking for a job on Wall Street, but perhaps trying to stretch your clothes budget was not considered a problem for Esquire readers. The coat’s hidden button placket is certainly a dressy touch. The editors went on at length — and with disapproval — about Joe College’s insistence upon wearing “bruised” and “battered” dark brown snap brim hats, “pinched unmercifully at the front of the crown.” We “know that nothing can be done about it,” they admitted, although “right thinking citizens and hat makers” were offended. Ah, the good old days — when college students could express a rebellious streak just by wearing a battered and sharply pinched brown felt hat with a black (instead of matching) hatband. The sight of an eighteen-year-old solemnly smoking a tobacco pipe must have amused — or outraged — a few adults. College students wearing hats and smoking pipes. 1933-1934. 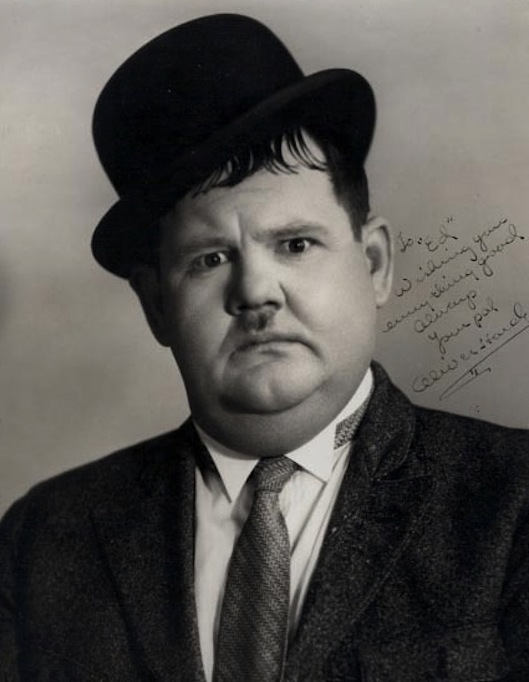 The little moustache on the lower right was not yet associated with Hitler, but why would a young man want to look like Oliver Hardy or Robert Benchley? 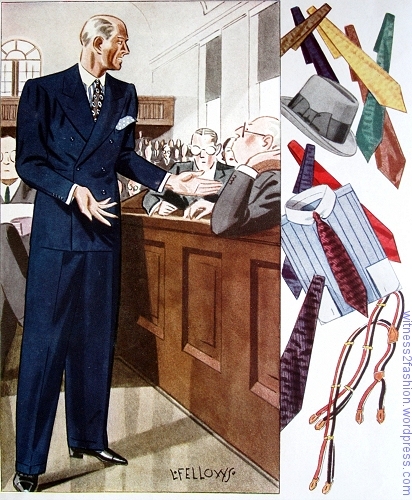 One of many pages of men’s fashions from the first issue of Esquire magazine, Autumn 1933. A good costume designer is just as interested in men’s clothing as in women’s, with good reason: There are far more parts for men than for women in plays, movies, and television. 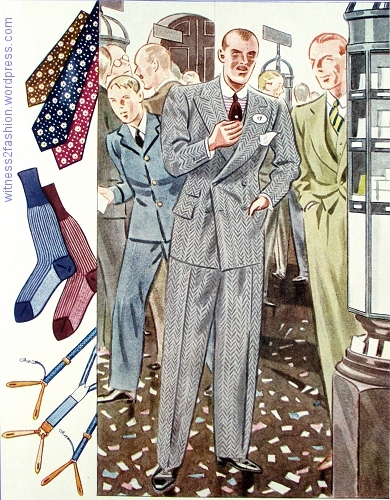 But dating men’s 20th century clothing is difficult for a number of reasons, among them a slower rate of change (men don’t buy a new suit for every new occasion, but wear them for years) and the subtlety of the changes (a quarter inch in the width of a lapel or a necktie, two versus three buttons, etc.) And not many theatres can afford a full-time tailor. 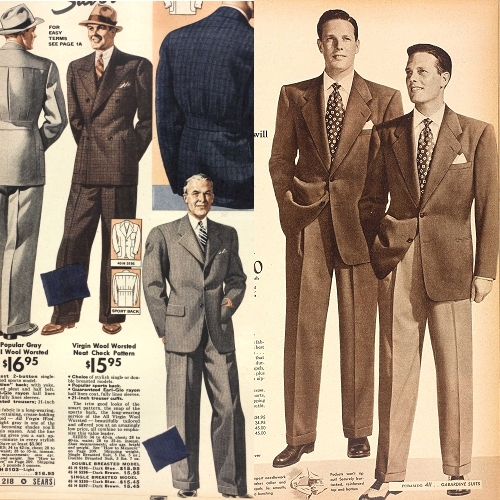 Men’s suits from Sears, Spring 1938 and 1948. Click to enlarge. Often, for budgetary reasons, “close is good enough” on stage because the audience probably won’t know the difference between men’s suits from 1938 and 1948 — although the difference in women’s fashions from those years would be clear. 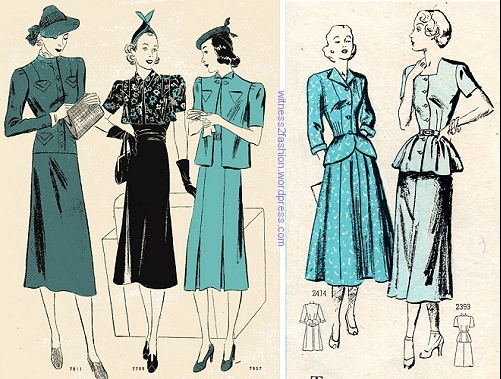 Women’s suit patterns, 1938 and 1948. The silhouette is very different. Click to enlarge. “This Our New York,” cartoon by Howard Baer. Esquire, Autumn 1933. Public transportation brings together a range of ages and ethnicities — all wearing hats and gloves. His flashy clothes (and appraising stare) imply that the man on the right is not a gentleman. The first issue was a quarterly — Autumn, 1933. 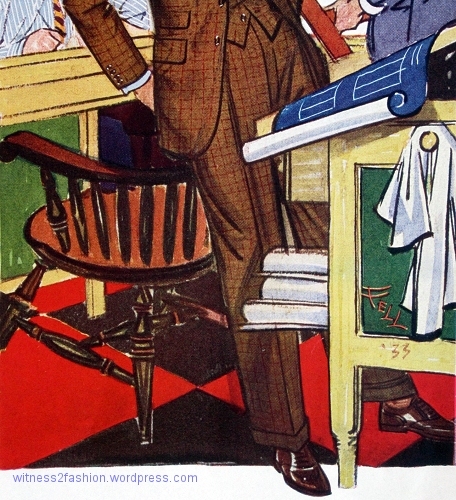 In 1934 Esquire became a monthly magazine. 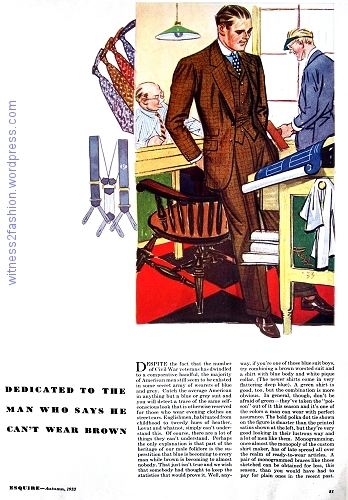 Like Delineator magazine, Esquire aimed at a middle-to-upper class reader. 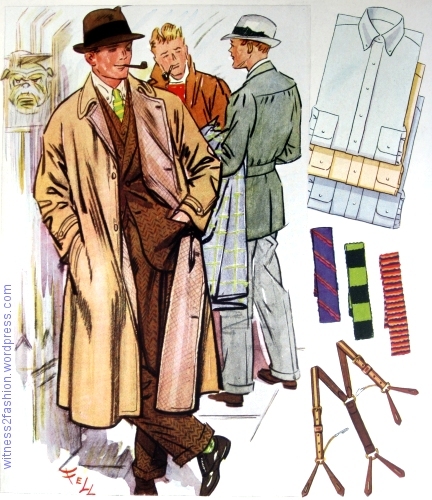 Just as Delineator focused on what was worn in Paris, Esquire was focused on successful, East Coast, Ivy League, business and professional men — and those who wanted to imitate them. 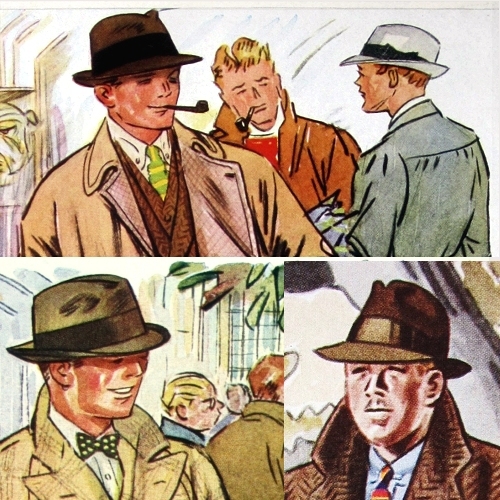 Many of the clothes are illustrated on older men of distinction; illustrations of sportswear (riding, skiing, and spectator sports like racing) assume that Esquire readers are far removed from breadlines and soup kitchens. 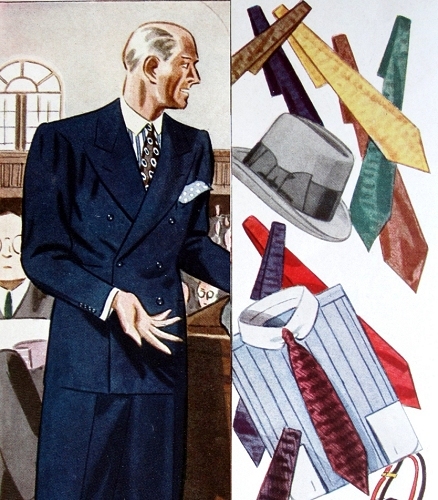 Navy double-breasted suit and accessories, Esquire, Autumn 1933, p. 82. This traditional double-breasted, navy blue suit “will never get you into the headlines as the Beau Brummel of your time,” but for the man who is not sure that his “taste in colors [is] to be trusted, sticking to plain blue is the most reliable way” to look smart. “You may not be resplendently right, but a least you can’t be clamorously wrong — you can wear almost anything with a blue suit.” Esquire recommends a colored shirt with white collar and cuffs. The one he’s wearing has bold stripes. 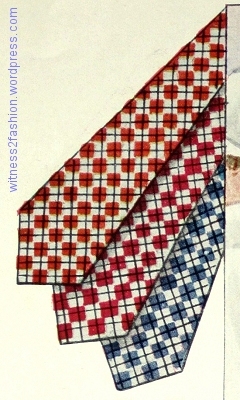 Colored pocket square. For wear with the navy suit, “self-figured” ties, gray Homburg hat, and a blue shirt with white pique collar and collar pin. Esquire, Autumn 1933. The full-legged, sharply creased suit trousers taper to a cuff. Cuffed, tapered trousers, 1933. They are exactly the right length to flow smoothly without a “break” [wrinkle] over the instep. Illustrations are by L. Fellows. Brown worsted checked 3-piece suit, blue shirt with white collar and cuffs, and polka dotted or printed satin tie. Esquire, Autumn 1933, p. 81. This young architect is wearing a three-piece brown suit with a small windowpane check. (For comparison, click here to see a 2016 three-piece checked suit — vest sold separately. The fit is very different, and the jacket very short.) Like the 1933 navy blue suit, these rather full pant legs are tapered and cuffed. 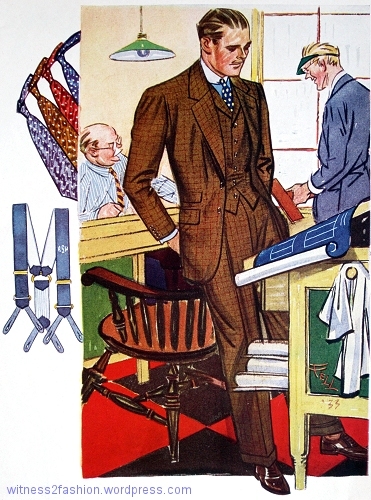 Tapered, cuffed suit trousers, Esquire, 1933. 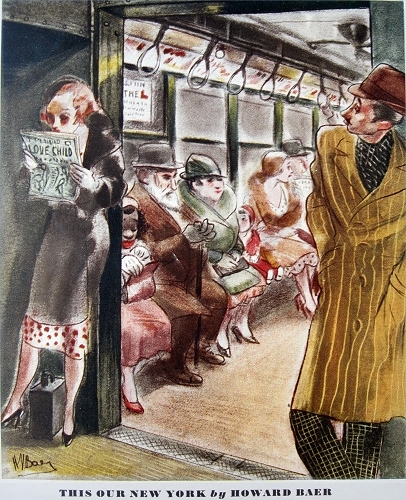 Esquire showed two brown suits in city settings; “Catch the average American in anything but a blue or grey suit and you will detect a trace of the same self-conscious look that is otherwise reserved for those who wear evening clothes on street cars;” Esquire blamed this on the “superstition that blue is becoming to everybody” while brown is not. “If you’re one of those blue suit boys, try combining a brown worsted suit and a shirt with blue body and white pique collar. (The newer shirts come in very flattering deep blue. )” All four suits have very broad, padded shoulders. 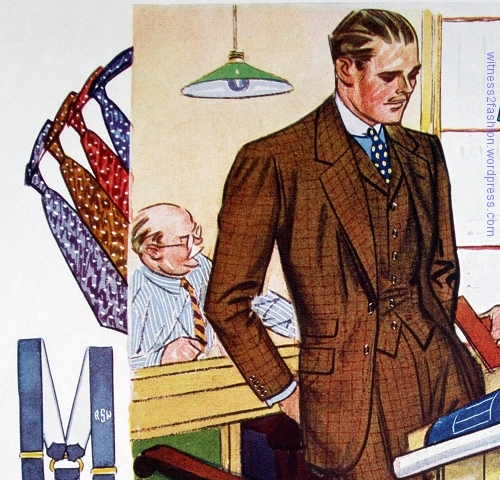 Two button suit with matching vest, which has a lapel; worn with blue shirt, white collar, and a selection of ties. Note the collar pin. Autumn 1933. 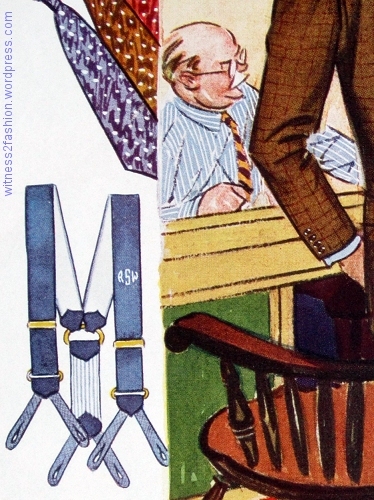 Monogrammed braces (suspenders.) 1933. Note the striped business shirt and rep tie worn by the older draftsman. A doctor wears a rough brown vested wool suit for a more informal appearance. Esquire, Autumn 1933, p. 87. Wide, tapering trousers and very wide shoulders. 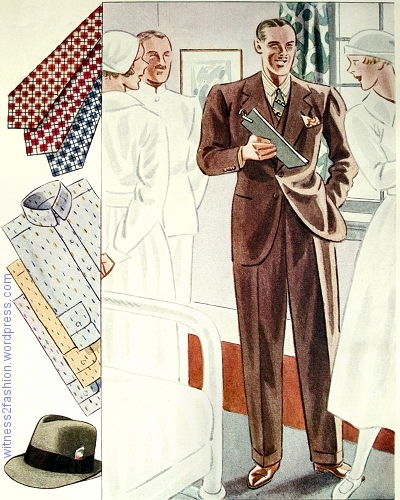 The doctor illustrated is wearing a “two button notch lapel modified drape model.” Notice the high waist and low crotch on the trousers, which are sharply creased and are cuffed at the tapered hem. 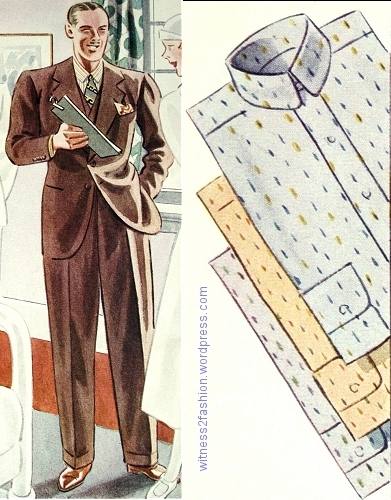 Two-button suit with matching vest, high-waisted trousers with cuffs, and “clipped figure” shirts. Esquire, Autumn 1933. 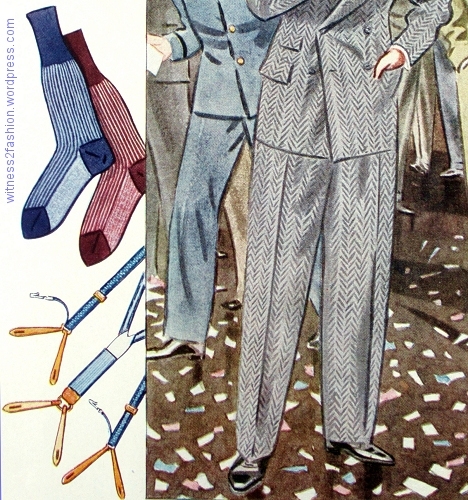 Gray double-breasted herringbone suit, without trouser cuffs and with a ticket pocket. Esquire, Autumn 1933, p. 93. Men’s waists were high. 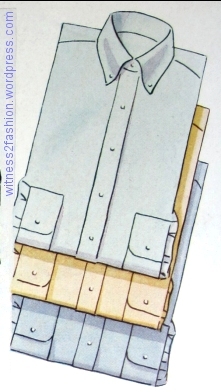 With this gray suit, he wears a horizontally striped shirt with white collar and cuffs; matching solid necktie. 1933. Is that a glimpse of a matching herringbone vest? “Vertical striped hosiery” goes well with the suitings in rougher textured fabrics. 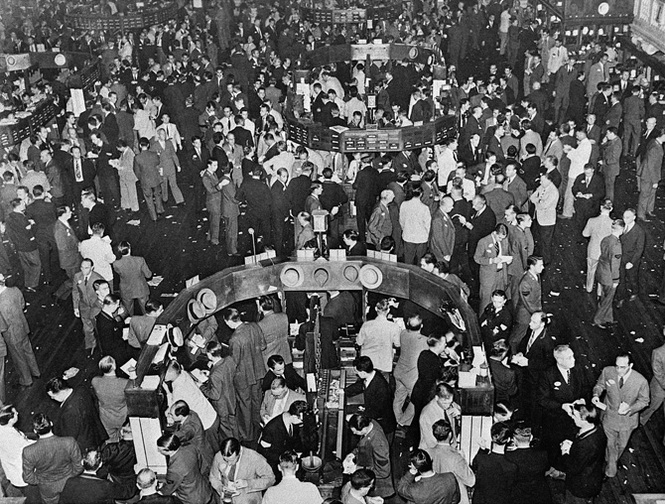 The number in his lapel, the slips of paper on the floor, the hurrying messenger — all are signs that this man works in the stock exchange. This photo confirms the background scenery, and this one shows exchange members with numbers in their lapels. 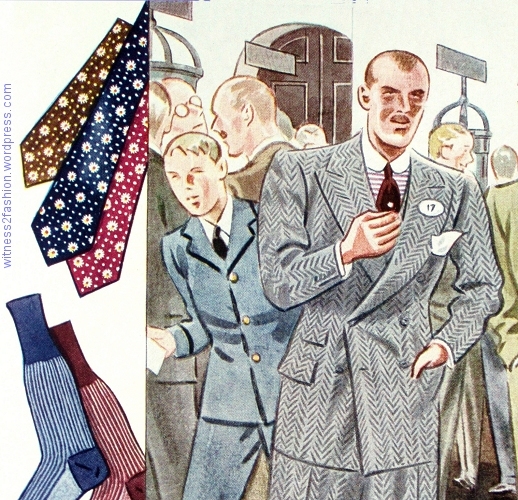 More 1930’s menswear to come ….